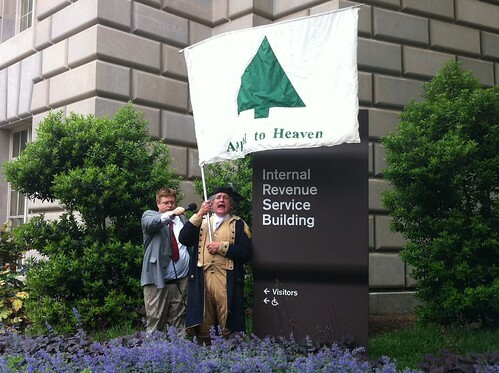 At noon, at various IRS offices around the country, Tea Party activists gathered and expressed some disagreements. Over what? I don’t think we need to explain that, at this point. I was working on Capitol Hill in the morning, so the protest closest to me happened to be outside the main IRS HQ downtown. 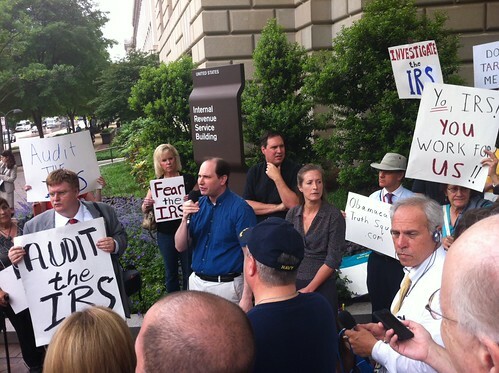 Slightly less than a hundred people, well covered by the press, gathered in a tight sidewalk area and decried the abuses, known and unknown, of the IRS. In the center of that photo: Phil Kerpen, who worked with Americans for Prosperity during most of the months when Barack Obama was decrying the group by name. “Don’t let the media spread the false narrative that there was a surge of 501 applications!” said Kerpen, in one of the most strategic speeches. There was more fretting about the media, in general, then I’d seen in four years of observing the Tea Party. The big DHS report on “right-wing extremists” being recruited thanks to the down economy came out a few days before the April 15, 2009 Tea Parties, and the activists had a laugh at the insult. Today, most of the activists I talked to declined to give full names, and two shielded their faces from cameras – one with a bag over his head. But some things don’t change.